Don't have time to thoroughly clean your chain after a ride? Even a quick clean and lube will make all the difference for that next outing. Maintenance & Cleaning Special: How Often Should You Clean Your Chain? ‘If it's threaded, grease it.’ Yes, you've probably heard it before and it’s as true today as ever. If it spins, turns, moves, slides, pivots, rolls or secures - it needs to be washed, cleaned, checked and lubricated. This month Bicycling Australia presents a series of articles on the critical importance of bike cleaning & maintenance. 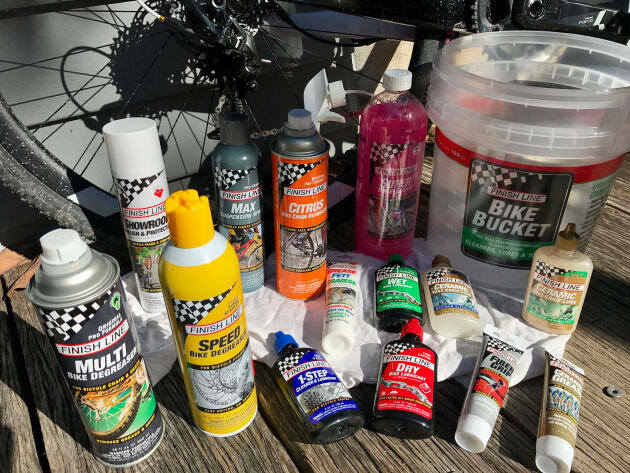 In conjunction with partners Finish Line, who for more than 25-years have been regarded as the lube experts of the bicycle industry, we’ll cover the full gamut of bike cleaning and maintenance tips, from a post-ride wipe-down to the thorough preparation of your bike for a race or Gran Fondo event. First up a little history about Finish Line. Since 1988 Finish Line have formulated all of its own cycling-specific products. The company is advised by pro cyclists, team mechanics, and bike shop mechanics from right around the world. They produce a specific and niche product for every bike-related application with the range covering cycling-specific degreasers, a variety of lubricants, bike washes, cleaning brushes for specific components and chain cleaning tools. 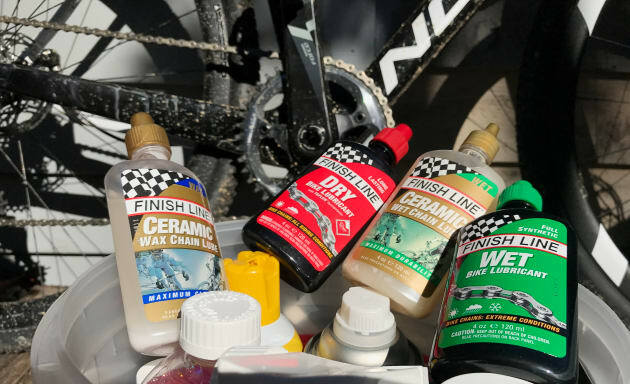 There are no excuses for a dirty bike with the full range of Finish Line bike cleaning products on hand - time to get cleaning! There’s fluorinated bearing greases (a specific high temperature grease for ceramic bearings), and specialty suspension and brake fluids. Finish Line even produce a specific lube for electronic derailleurs! With pro teams including BMC Racing, Trek Factory Racing and Direct Energie relying upon Finish Line for all their cleaning, lubrication and maintenance needs, we feel if Richie Porte puts his faith in it, we’ll do so as well. Far from the most efficient way to transfer energy from one place (the pedals) to another (the rear wheel), a chain needs all the help it can get. A clean chain is as critical as a properly lubricated one. Ideally, chains should be thoroughly cleaned after each and every ride. Unfortunately not many of us have the time to do this, but even a quick wipe with an clean rag can make a huge difference. We've found Finish Line Dry Lube to be a reliable, hard-wearing and efficient chain lubricant - small 120ml bottles are available from most local bike stores. A gritty and grimy chain wont just negatively affect your performance, it will also lead to premature wear of your bike’s (expensive) drivetrain. We’d strongly recommend at least a quick clean of the chain after each ride, followed by the application of a quality chain lube. There are many schools of thought about how to properly clean a chain - ask 10 bike mechanics and you’ll probably get 8 different opinions. The cleaning process ranges from a simple wipe with a clean rag right through to a full degrease. A tip - centralise your chain on the cassette before back-pedalling to run the chain through the rag. Talking degreasers - you know the $2 cans available at auto outlets? Forget them … the ingredients can do more harm than good. They may be fine on various metals but can damage and stain plastics and carbon. We'll have more on the process of cleaning a chain in a future article. Finish Line produce a range of chain lubes suitable for all weather conditions and applications. With your chain grit-free and ready to freely spin again, it's time to apply a lubricant. Not sure which one? 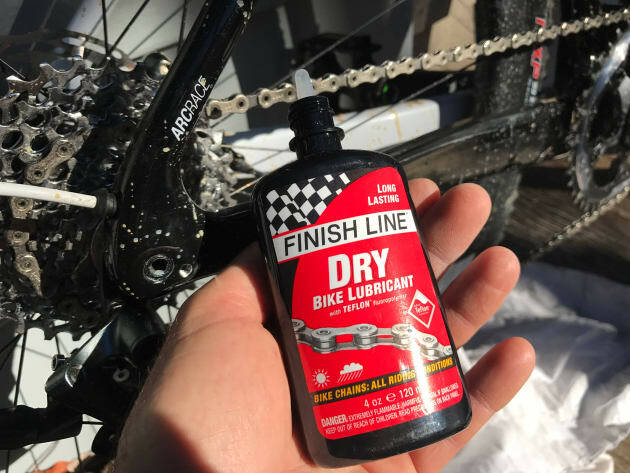 The specialists at Finish Line recommend their Dry Lube for those doing their riding on or off the road, in a range of environments from dry to dusty to wet. The product goes on wet and sets as a dry 'wax-like' synthetic film. This assists in keeping your chain clean while repelling grit, grime and dust. With Teflon a key ingredient, Dry lube helps minimise friction, repel moisture, and withstand up to 160 km of riding. Dry Lube is also recommend for brake pivot points, derailleurs, shifters and cables. It is Finish Line's most popular and versatile lubricant and one of the best sellers in Australia. Finish Line products are available from most local bike shops as well as a range of online outlets. The pocket-sized tube of Dry Lube is a must have, here at Bicycling Australia we don’t ride without it.